Karen Kurr’s cottage business, No Time 2 Cook, grew from her home kitchen into Kroger stores. And, Mississippi State’s Home Extension and Food Science Departments provided many of the key resources needed. Due to faculty support with labeling, pricing, and more, Karen was able to enter into production and sales with her favorite family recipes. You will find Chicken Pie, Chicken and Dressing, and best selling Chicken and Dumplings on Kroger shelves throughout the deep South. 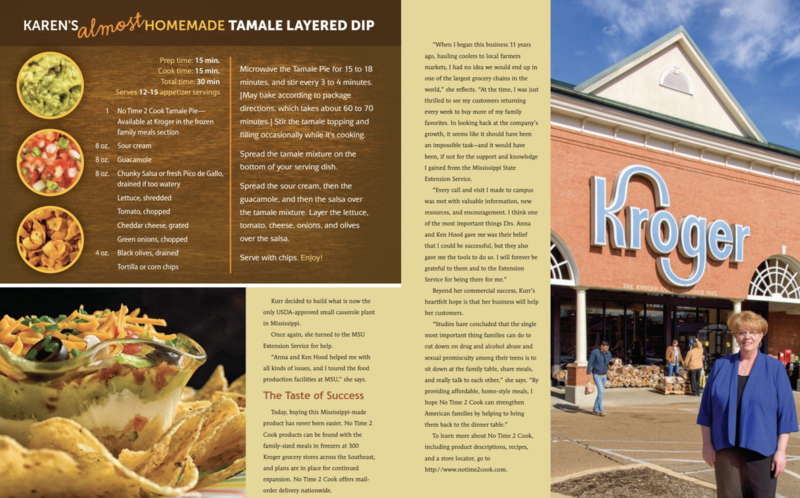 In addition, other small retail stores carry more products such as Karen’s Chicken Tetrazzini and Poppy Seed Chicken. Also, No Time 2 Cook’s complete menu is available through their online store. Read the story of how Karen made all of this happen with the help of Mississippi State in Extension Matters.